BRANSHES contributes to Sustainability together with I:CO! Popular kids fashion brand BRANSHES, which operates 160 shops and online shops throughout Japan, started a garment collection with ICO at select BRANSHES stores from March 30th 2018. It is the first first fashion brand in Japan that collects throughout the year and BRANSHES will continue to expand the number of participating stores in future. Through this initiative, BRANSHES, who places great emphasis on high-quality materials, makes an important contribution to sustainability. Every year, millions of tonnes of used shoes end up in landfill sites or incineration plants. This results in the loss of valuable raw materials and natural resources. Every day, tens of thousands of used shoes are delivered to SOEX’s sorting and recycling plant in Wolfen, Germany. A large part of these tends to still be in good condition and can be worn again. They are distributed and sold around the world as secondhand products. This leaves around a quarter of the shoes no longer fit for use and the need for them to be disposed of professionally. 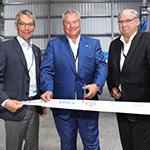 Following a five-year development phase, I:CO together with SOEX, a global leader in the field of used textiles marketing and recycling, presented the world’s first shoe recycling plant able to process all types of footwear. This pioneering system will serve to reduce waste and to close production cycles helping to enable a circular economy for the industry. It is, moreover, the first ever system able to mechanically disassemble all shoe types into their components, and to then derive from them usable secondary raw materials such as rubber, leather or foam. 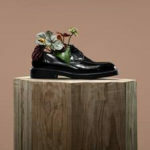 The innovative system provides a much needed truly sustainable solution for all unwearable shoes! The Copenhagen Fashion Summit kicks off on Tuesday, May 15. Influential fashion industry decision makers come together at the world’s largest event on sustainability in fashion. The Summit’s “Commitment to Change” in 2017 was a major call to action to fast-track change in the industry towards a circular system. Due to the urgent need to accelerate sustainability in the fashion industry, Copenhagen Fashion Summit 2018 introduces an exhibition space called the “Innovation Forum” to feature new, sustainable solution platforms. 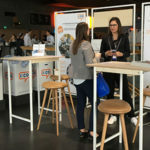 This new component of the Summit enables fashion companies to meet the most noteworthy sustainable solution providers, and I:CO was selected as one of them. I:CO will showcase its innovative, global take-back system for apparel and footwear companies. The Innovation Forum will be open to all Summit guests during the two-day event. As a global leader in the outdoor apparel and footwear industry, our partner Columbia Sportswear is committed to protecting the greater outdoors and giving back to its communities. 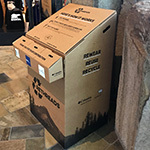 I:CO is proud to support their mission through Columbia’s ReThreads recycling program. All of its US stores accept unwanted clothing and shoes, and I:CO helps give these items a new life. To jumpstart 2018 spring cleaning time, Columbia will donate $1.00 USD to select non-profit organizations for every pound of clothing and shoes collected at its stores through March 27, 2018. Each participating customer will be given a token coin to place their vote for one of three non-profits: American Hiking Society, National Park Foundation or the Children and Nature Network. Through the ReThreads program, Columbia is joining the movement to significantly reduce the amount of apparel and footwear that ends up in landfills in order to help conserve material resources, reduce our collective carbon footprint, and renew communities and the planet. From March 11-24, Target, a U.S. based retailer, will invite guests to conveniently drop off their old denim clothing at select Target stores. Any brand or style in clean, dry condition will be accepted. Target is teaming up with I:CO, who will take the items on a journey to be reused or recycled into new products. Through the program, Target and I:CO are expected to keep more than 50 thousand pounds of denim out of landfills. This is the first denim trade-in program for Target and is testing what works best for the guest and the business to help inform future programs. The program supports Target’s goal to make it easy for their guests to do something positive for the planet and their communities. 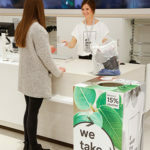 C&A expands its ‘We Take it Back’ programme and invites all customers in Belgium, Netherlands, Luxembourg and Switzerland to bring their used clothing and shoes to their favourite C&A store to give them a new life. In return you will receive a 15% discount voucher for your next purchase. By 2020, C&A plans to offer this return opportunity in all its 18 European retail countries and in Brazil, Mexico and China. Since 2012, C&A has been offering its customers in the Netherlands an option for their unwanted clothes. During that period, C&A Netherlands collected 278,000 kg of clothing in collaboration with I:CO ensuring these items will be reused or recycled. In cooperation with I:CO, the Swedish shoe manufacturer Vagabond offers its customers an opportunity to take responsibility for their used shoes. These can be returned to Vagabond stores in Sweden, Finland, Poland, the Czech Republic, Hungary and Denmark regardless of brand and condition. Ulrika Simonsson, CSR Manager at Vagabond explains the commitment of her company: “Recycling is, alongside with our aim on using more sustainable materials and production processes, a focus area for us where brands and consumers really can cooperate in closing the loop.” I:CO ensures that the returned shoes are used for the most ecologically next best use and thus get a new life.